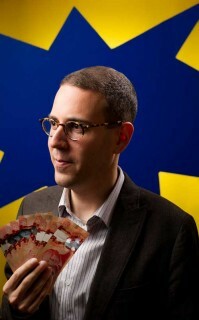 Money talks: Avi Caplan sees the Awesome Foundation movement as "an interesting experiment in philanthropy" — a way to connect with people more directly. Photo by Luther Caverly. There wasn’t any money lying around anywhere. Not a penny. Not on the table, not on the floor, not even — I’d bet, if I’d had the nerve to check — under the couch cushions. This was more than a little disappointing. I was standing in the living room of Avi Caplan, a philanthropist who refuses to see himself as a philanthropist. Every month, Caplan just gives some of his money away. I figured him to be a careless spendthrift, a man without a bank account, a man with piles of coins stacked to the ceiling that he idly let fall between his fingers while talking. But no. The apartment is modest, neat, tidy. Caplan too. There’s no air of madcap millionaire, probably because that’s not his angle. The 30-year-old is the new dean of Awesome Ottawa, the local chapter of the Awesome Foundation. Awesome Ottawa hands out $1,000 each month to a project it deems “awesome,” with each of its trustees ponying up $100 a month of his or her own money to contribute to the grant. Caplan was drawn to Awesome Ottawa from the moment of its inception, answering a Twitter call-out for people interested in awesomeness to meet to see if a chapter might fly in Ottawa. He met with nine other would-be philanthropists who aren’t philanthropists. They jointly decided, on the spot, to give their first award to an art flash mob. That was in May 2010, and Ottawa became the first Canadian city to have an Awesome chapter. It has since given money to The Capital Reading Garden, the University of Ottawa’s Quidditch Team (a real thing), the Hello Ottawa blog, a bus yarn-bombing, Hidden Harvest Ottawa, and about two dozen other projects.